My son Brian suffered a series of debilitating strokes following a rare infection of his brain in December 2003 at the age of 5, which left him in a comatose state, severely brain damaged. After all the Doctors, including the specialists ran their many tests they told us to discontinue any supportive medical treatment for Brian and “pull the plug”. They said that Brian as we knew him, was no longer inside and that their was absolutely no hope for any recovery and it was just a matter of time before he would die anyway. Hearing this we had a Priest from our local parish perform the sacrament of Confirmation for Brian in lieu of last rights since he was not old enough for Original Sin. Going against medical advice, WE REFUSED TO TAKE OUR SON OFF OF HIS LIFE SUPPORT. To the surprise of all his Doctors, Brian slowly began to improve into what is called “a minimally responsive / semi-vegetative state” breathing through a tracheotomy and being fed liquids through a "G-Tube" placed in his stomach. Although he was improving, eventually Brian was left blind, unable to speak, could only minimally move only his right side and appeared to be extremely cognitively impaired. 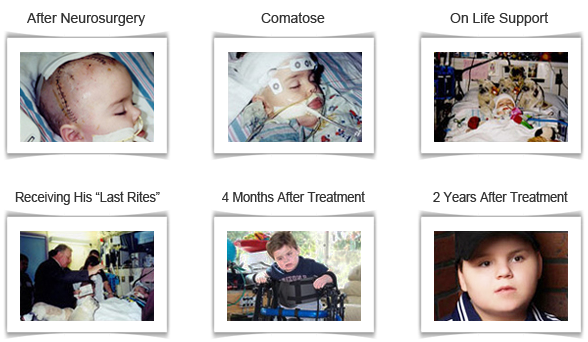 This continued for three years until I found Stem Cell of America to treat Brian with the Fetal Stem Cells. Sixty days following his first treatment miraculously Brian began to speak. Initially a few words and then within only a few more weeks, it had progressed to over 500 words. Slowly but surely Brian's speech continues to improve. He is now initiating as well as carrying on conversations with us, and others. Now his vision is starting to return, his left side which was completely paralyzed has begun to move currently with his much improved right side and all of his extremities are becoming much stronger. His tracheotomy has been removed because he breathes normally and he is now able to feed himself. The progress we see in Brian continues to build every day with no regression. My son Brian calls the Fetal Stem Cells "Miracle Juice". They say the creation of life is miraculous, well then maybe Brian's right, they should be called MIRACLE JUICE, I know that's what they are called in our house. I firmly believe that the fetal stem cells have dramatically improved my son's level of function. My family feels they have transformed my son's life, giving our family hope and giving Brian a quality of life we once thought to be impossible for him to achieve.